United States President Barack Obama’s decision on June 13 that the US will supply light weapons to insurgent groups in Syria and the discussions with Russian President Vladimir Putin on Syria during the recent G8 meeting have confirmed the declining ability of the US and its allies to shape events in West Asia -- and the fact that the Syrian civil war will continue to the bitter end. And this end, whatever form it may take, is nowhere in sight. Let’s first look at the now-fading diplomatic prospects for a new Geneva conference on Syria. The fact is that, even though US Secretary of State John Kerry has dropped the US prerequisite that Bashar al-Assad’s departure as Syrian leader should be a precondition for talks on a new power arrangement in Syria, Assad continues to have no interest whatsoever in any negotiation. 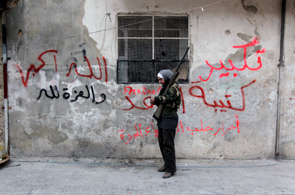 First, Assad considers that two years of fighting have proved his staying capability. Second, he is smart enough to know that once negotiations begin, the outcome will be -- even in the best scenario for him -- the end of his power as he has exercised it since his father’s death. In addition, powerful military groups will not look idly at the prospect of their status and lives being endangered by an arrangement in which, by definition, they will lose. Things have gone too far already, with at least 90,000 deaths; and mercy and brotherly reconciliation are not the region’s strengths. The only factor that could push Assad towards negotiation is a reversal of Moscow’s policy of quasi-unconditional support to him. However, contrary to the wishful thinking Western leaders have been indulging in, there is no reason for President Putin to change his position. He knows that this would be seen as a diplomatic defeat for him if he were to do so, whatever the pretence under which it is undertaken. And this would also affect Moscow’s position vis-a-vis Iran as well as China, which observes the unfolding of the Syrian drama with tremendous interest. In addition to some possible strategic gains such as a Russian naval base in Syria, the enemies for President Putin are extremist Sunni groups of the kind he is fighting in Chechnya; so he has ample reason to side with the Shi’a in what is increasingly becoming a region-wide frontal Sunni-Shi’a confrontation. If you take President Obama’s decision to supply small arms to the insurgents, the reading is very clear and quite different from the official rhetoric about the ‘Red Line’ having been crossed by Assad with the use of chemical weapons. Any US involvement that would have a chance to tip the scales would include the establishment of a no-fly zone as well as the provision of sophisticated weapons, such as surface-to-air missiles, to the insurgents. Obama knows that by establishing a no-fly zone along the Syrian border with Jordan and/or Turkey, he runs the big risk of being gradually sucked into a wider involvement in the Syrian war. His military establishment does not want to hear about that. And any president considering re-plunging the US into the quagmire of military involvement in West Asia -- after Afghanistan and Iraq -- would have to be treated for suicidal tendencies. Barack Obama, the ever-cautious realist, is definitely not the suicidal type. The provision of sophisticated weapons to the insurgents is as risky: all talk about “vetting” the insurgent groups to which such weapons would be delivered is just hot air. The insurgents are splintered into so many groups that it is very hard to keep track of who is allied with whom. Nobody can dismiss the risk of some of these weapons falling into the hands of jihadis, who are increasingly a key force among the insurgents. Moreover, the argument presented by the advocates of a significant US role -- that such involvement is the only way to prevent the establishment of a jihadist/Al Qaeda state in Syria -- is hardly convincing: the US would need to deploy considerable economic, political and military support. Besides, for a very long time, it should be able to sustain moderate groups and prevent a takeover by militant Islamist forces after the insurgency prevails -- if it prevails. It is extremely unlikely that Washington would have that kind of staying power in the post-Iraq, post-Afghanistan context. And it’s pointless to hope that the Europeans will step in. The situation is made even more complicated by the fact that two official allies of Washington -- Saudi Arabia and Qatar -- are fiercely competing for influence through their support to distinctive rebel groups, placing their respective bets in a post-Assad scenario. In the same way, nobody can really make a convincing case as to why the risks involved in getting significantly involved militarily now would be dwarfed by the risks of doing very little. The truth is that all this remains based on conjectures. A surviving Assad regime will be so drained, and harassed by a continuing internal guerrilla conflict, that one needs to ask how useful it would be as a relay for Iranian influence in the region. In the opposite scenario, a Sunni Muslim Brotherhood/jihadi type of regime replacing Assad in Damascus would be subject to all kinds of antagonistic regional pressures and overwhelmed by a dismal economic and social situation. The third -- and maybe most likely -- scenario is one of a split Syria divided into an Alawite Shi’a-dominated part, a Sunni-dominated part and other parts with different minorities (Druze, Kurds, Christians). Even here, nobody can fathom the implications for the region. The turn of events in Libya (which is still in chaos) or in Egypt (where the political situation is now deteriorating as fast as the economy) has taught the Americans and the Europeans that meddling in Arab affairs is like playing the apprentice sorcerer. The US as a deus ex machina is now a notion of the past. This is where the reading of President Obama’s decision becomes very clear: Washington’s set course is to “calibrate” its military support in trying to do enough to help the insurgents continue their fight, which will prevent a victory for Bashar al-Assad (which would also be a victory for Iran, Hezbollah and Putin), while making sure it avoids being sucked into a more significant, more costly, and politically unbearable involvement in Syria. Historians and editorialists will presumably argue for a long time whether a different American or Western stance at the start of the insurgency would have been able to shift events in a different direction. Meanwhile, the death toll will keep rising.